Fourteen years ago last night, I was sitting on the floor of my new bedroom in Marywood house, sobbing. Tomorrow I would receive the short brown veil of a postulant and begin a year of discernment and prayer as an extern sister, a year of getting to know the community I wanted to spend the rest of my life with. But for now, I was too busy crying about leaving my family to feel excited about the beginnings of life as a nun. I just wanted to go home. A religious vocation is a mysterious thing. Mysterious because one can never figure out just how one arrived at it, or how, by God’s grace, one has persevered thus far, when there are so many other souls better suited to, and better qualified for, the job. Sr. Grace Marie always reminds us about Sr. Veronica, who died in the 1980s, long before I entered. She had been Mother Angelica’s Abbess in Canton, but stepped down because she felt called to join Mother in Alabama. Sr. Veronica lived to her 90s, and everyday she prayed to God for holy perseverance. I don’t know at what point they finally decided that I might actually have a vocation, but I suppose if they were basing things on my mood at the time I entered, then I can see why they expected me to show up on the parish door step any day. We all went out for a final dinner at the Olive Garden the night before my entrance, and I cried the entire time while they tried to make jokes about my mom’s cigarettes and her passel of cats. Nothing could assuage my tears. It was a miserable dinner. Luckily, my salty beginnings weren’t an indicator of how long I would last in religious life, nor of the joy and fulfillment I would find in my vocation. I chose the Feast of Our Lady of Mount Carmel as my entrance day because I wanted to begin my new life in Christ under her motherly care and protection. Lord knows, persevering in any vocation, whether you’re a priest, a religious, married or single, can be a struggle which at times can seem impossible. Without Our Lady’s help and guidance I could have never persevered. 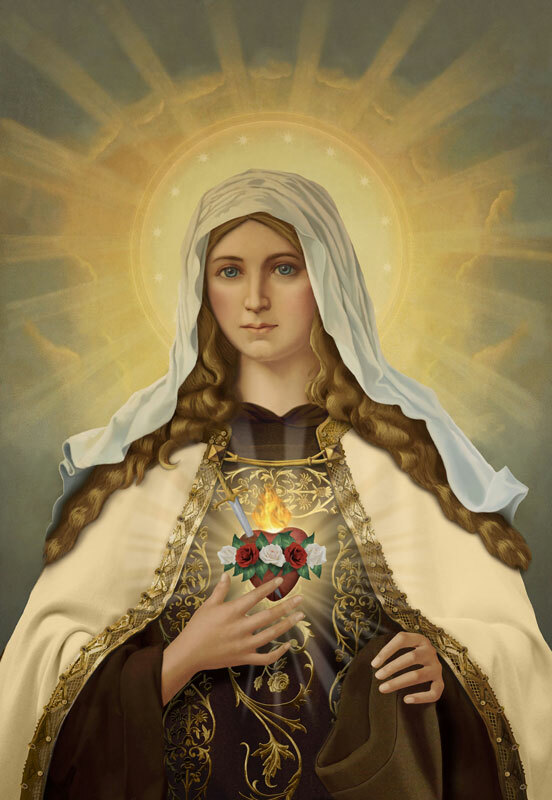 And if I want to continue following Christ, if any of us want to continue following Him, the best way to do that is by keeping safely under her mantle of protection. Thank God for God! For His goodness and grace and mercy. Without it I wouldn’t be here. I still can’t figure out why He called me to this life, but I am so glad that He did. This entry was posted in A Nun's Life, Our Lady and tagged Our Lady of Mt. Carmel, perseverance, postulant, religious life by srelizabeth. Bookmark the permalink. I have just read your entry and feel compelled to respond. I am very happy that you listened to God’s calling, that He allowed you to answer His call. I will continue to keep you in prayer asking that God grant you strength, compassion, courage and wisdom as you continue to be a vessel for His glory and for your fellow mankind. Always seeing another daughter/sister in Christ who loves Our Lady of Mount Carmel as much as I do, means so much. It’s like God allowing me to see small glimpses or miracles that unite us to each other and to Him. My birthday is July 16th the Feast of Our Lady and the day we (my lovely husband of 20 years) decided or should I say were divinely inspired to homeschool our children over 3 years ago. It is now the name of our home school, Our Lady of Mount Carmel Academy – Dy-Liacco Home School. If you are ever able to visit with us we would love that. We too just relocated to the San Antonio/Boerne Texas area from our home of 22 years in Tampa, FL. May God provide at this moment peace, joy and hope in your heart. Sister, never have I been so happy about being wrong! Well, you are rarely wrong, so I won’t hold it against you. Besides, I don’t think anyone else thought I would last very long, either. This was one of my favorite posts! It is so neat to hear about your story. I’m glad that I know you all!! I’m certain others will join me in saying we’re glad He did, too! You’ve written some lovely posts that have been an inspiration to many. You never know when you send out the message of God’s love what soul will be there to catch it! Heartfelt thanks, and congratulations! Your words brought a smile to my face. It amazes me how God calls us to share our REAL feelings and then teaches us about his abundant blessings. Your faithfulness is a great example. Thank you for sharing. Thank you Sister Elizabeth for sharing such a beautiful story.